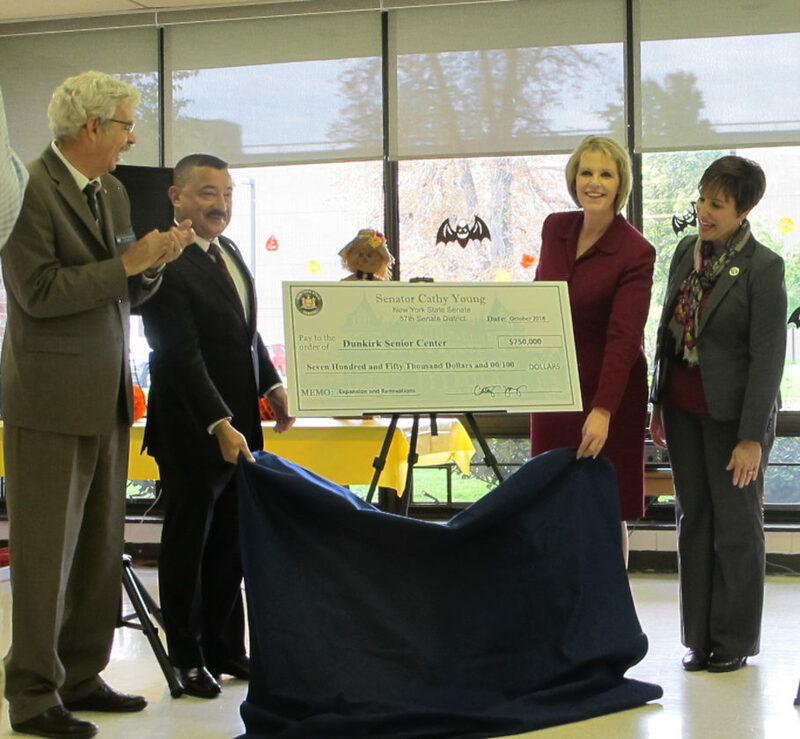 Pictured from left, Assemblyman Andy Goodell, Mayor Willie Rosas, Senator Catharine Young and Dr. Mary Ann Spanos unveiled a check for $750,000, a State and Municipal Facilities grant to fund an expansion and renovations to the Dunkirk Senior Center. In a demonstration of true bipartisanship, Dunkirk’s Mayor Willie Rosas, together with Senator Catharine Young (R,C,I-57th District) and Assemblyman Andy Goodell (R, 150 District) worked hard to secure a $750,000 State and Municipal (SAM) Facilities grant to fund an expansion and renovations to the Dunkirk Senior Center. Senator Young was joined by state, county and city officials in making the announcement, which was held at the center. Senator Young applauded the work the senior center has already done and shared her enthusiasm for its continued success. 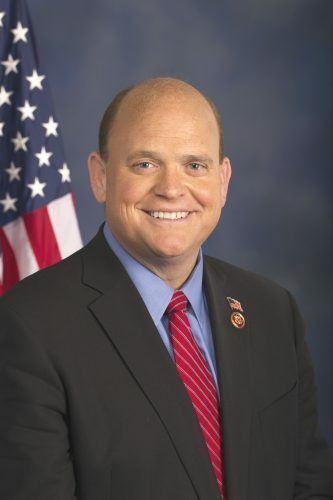 “That is why securing a $750,000 grant to support a critical expansion and renovation of the Dunkirk Senior Center was a key goal for me this year. The city of Dunkirk and the Chautauqua County Office for the Aging worked together to develop an innovative, exciting plan to not only expand the building’s footprint, but the scope of its services,” Senator Young said. First established in 1976, the Dunkirk Senior Center offers seniors a place to gather in the comfort of their peers, allowing them to socialize and support each other. 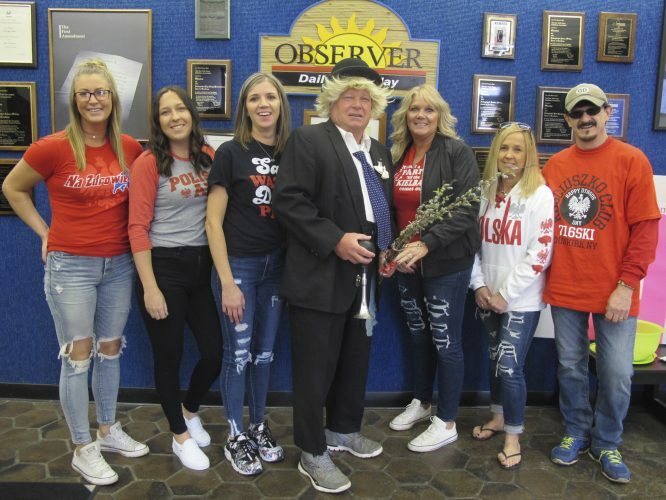 There are also a variety of offerings that enhance the quality of life for area seniors, including trips, meals, information seminars, health, fitness and wellness classes; arts and crafts and a variety of leisure activities. The center currently has about 650 members and serves another 1,500 through an onsite OFA office. With many repairs and updates to the aging building needed, leaders from the city and the county used the opportunity to rethink the center’s existing role and imagine a more expansive model of services and programs. They conceived of transforming the center into a community hub where health care services and adult day services could co-exist under one roof with existing social, educational and wellness programming and events. Implementing such a model at the Dunkirk Senior Center would essentially create a NORC (Naturally Occurring Retirement Community) where everything people need to age in place is in the neighborhood. That model formed the basis for the grant application and resulting award. Over the winter, input will be solicited from Dunkirk seniors and the community on needed/desired features of a renovated Center and taken into consideration in the development of the final architectural plan. The final plan will be all-encompassing, representing a facility that can grow with the community in the decades to come. Renovations will be carried out in phases, in conjunction with available funding. This first grant award will finance the largest component of the project: an addition of approximately 2200 square feet that will include an activities area; two bathrooms with showers; two doctor’s offices and clerical offices. “I am very thrilled about this project and grateful to Senator Young for her work on behalf of seniors. The Dunkirk Senior Center, like much of Western New York’s housing stock, is very outdated in its design and how the physical space functions. This grant will not only transform the space, but bring in new partners and programs so we can offer more services that meet the needs and desires of older adults today, and into the future,” said Dr. Mary Ann Spanos, Director of Chautauqua County’s Office for the Aging. “I want to thank New York State for all of the support and attention the City of Dunkirk has been receiving. I also want to thank Senator Young for her assistance in obtaining this generous grant of $750,000 towards expansion and upgrades to our Senior Center and our continued collaborative efforts to improve the quality of life for all our residents in the City of Dunkirk. I also want to thank my staff and the Chautauqua County Office of the Aging for their partnership role in writing this grant. These funds will go towards expansion and upgrades at our Senior Center in order to increase the services provided for our seniors in the City of Dunkirk. Expanding services at this site is very important to me and I am very proud to be improving quality of life for our senior citizens,” said Dunkirk Mayor Willie Rosas. Spanos told the OBSERVER that work on the project will likely begin spring 2019, and is looking forward to the planning process this winter. “The best day is going to be the day that we cut the ribbon on this new and improved facility,” Young stated.